Italian Talmudist; born in Candia; son of the philosopher Elijah Cretensis Delmedigo; studied at Padua under Judah Minz; he then returned to his native city, where his reputation as teacher of the Talmud attracted many pupils, among them Samuel Algazi. He was in continual controversy with the aged historiographer and teacher of the Law Elijah Capsali, who also had a school at Candia, both of the adversaries succeeding in rousing the interest of their most eminent contemporaries. Traces of the many differences of opinion that separated these two men and led to bitter disputes between them may be found in the responsa of the foremost authorities of this time. The liturgical poet Moses Alashkar, Elijah ben Benjamin Halevi, Meïr Katzenellenbogen of Padua, and David ibn abi Zimra make mention of these two scholars, who had laid disputes before them. 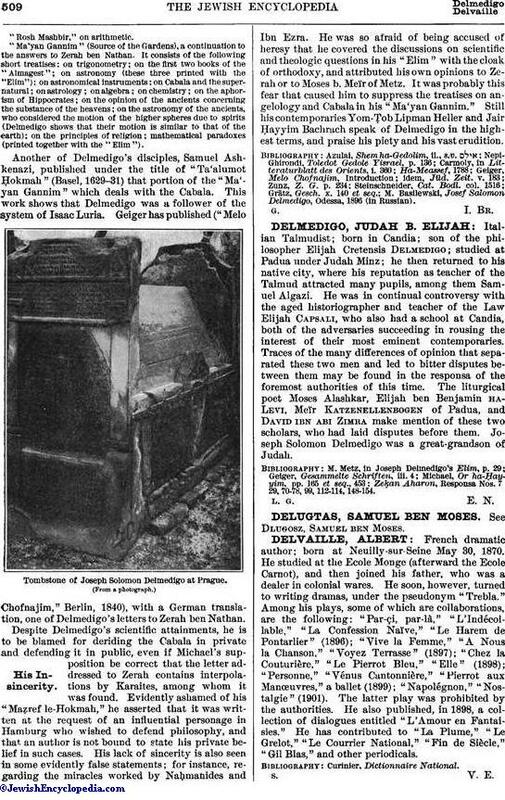 Joseph Solomon Delmedigo was a great-grandson of Judah. Zeḳan Aharon, Responsa Nos. 7. 29, 70-78, 99, 112-114, 148-154.